Sibenik is the oldest native town in Croatia. It was mentioned for the first time in 1066 in a document issued by Petar Kresimir IV, the most important Croatian king. Sibenik is located at the coast, at the mouth of the river Krka. It was built as a castrum at the bottom of the St Michael’s fortress which dominates the town even today. There are three more fortresses in Sibenik which prove its importance and strength: St John, St Nicholas and Subicevac. The climate in Sibenik is typically Mediterranean; hot and dry summers and mild winters; there are 35 000 people living in Sibenik . 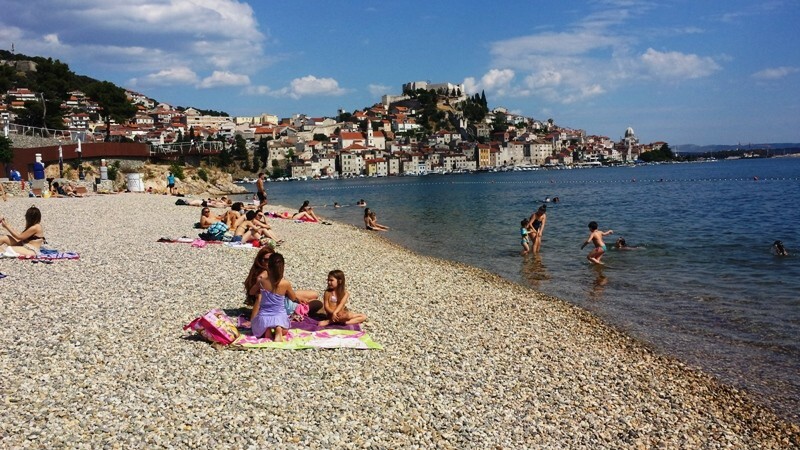 Banj beach is the public beach in Sibenik; a pebbly beach recently renovated and the owner of the Blue Flag. Many contents can be found on the beach like volleyball and basketball playgrounds and even a fitness park. Solaris Beach Resort – with its famous sandy beach, the Solaris Resort is perfect for a vacation, not only because of its sea but also because of its rich offer. Solaris has a 4 km long coastline so those who do not prefer sand will also be able to find other types of beaches. 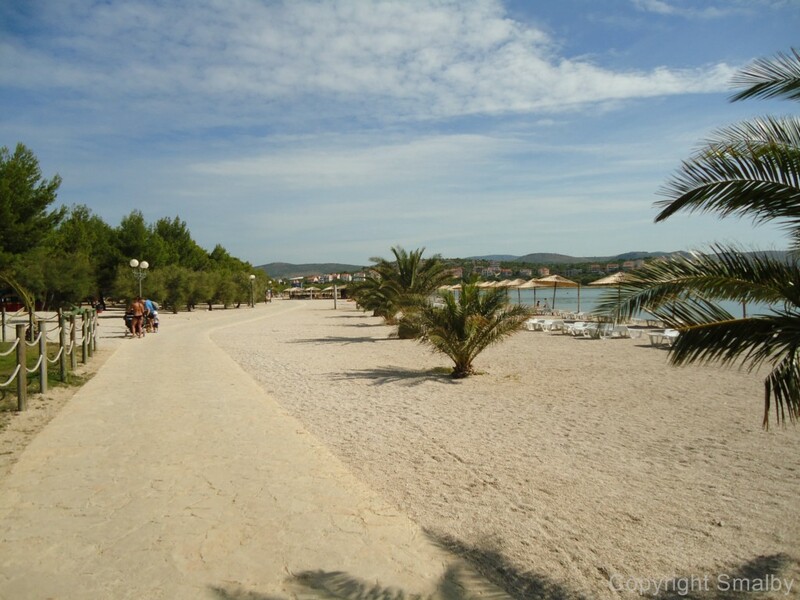 Jadrija beach is another public beach in Sibenik; it is the favourite beach of the local people, equipped with many contents. 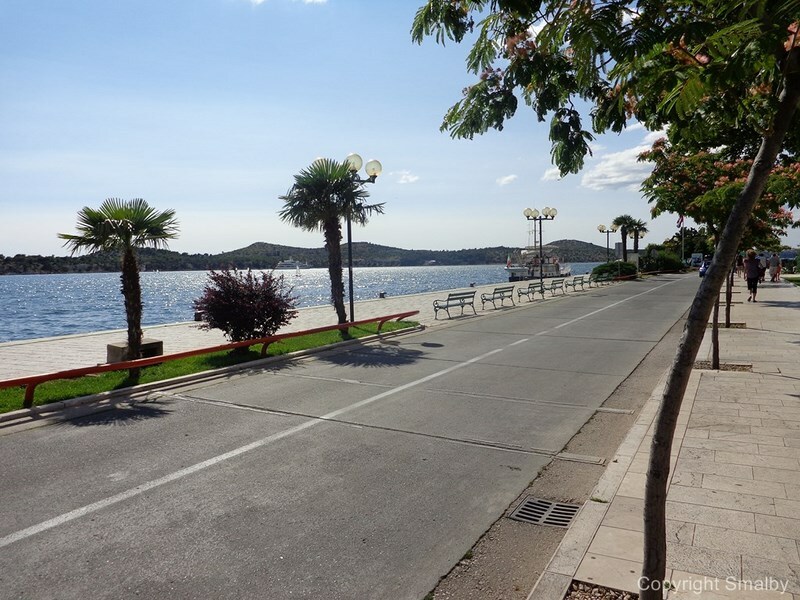 Sibenik has recently started investing into tourist facilities and this has resulted in many new private apartments as well as some new and renovated hotels. Hotel Panorama is a completely renovated hotel with a long tradition. It is one of the first hotels in Sibenik; it is situated on a cliff overlooking Sibenik and the submerged Krka river estuary and that’s why it is called Panorama. The hotel has 40 rooms with balconies; the rooms are equipped with a mini bar, a TV, a SAT TV device, a telephone, a bathroom, Wi-Fi… The hotel has a restaurant with a capacity of 300 people together with the terrace. There is an outdoor pool with sea water and near the hotel there is a new football playground. Guests also have a parking at their disposal. Since it is located very close to the Sibenik bridge, the adrenaline lovers can try bungee-jumping. The most famous hotel complex in Sibenik is the above mentioned Solaris Resort which has a 40 year old tradition in tourism and catering. 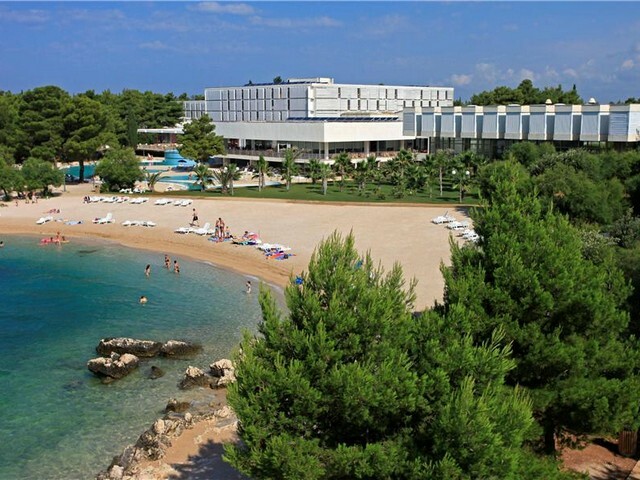 The resort is situated on a peninsula, 7 km from Sibenik. There are 4 hotels within the resort, three four-star hotels and one three-star hotel, The Kornati villas with apartments, an auto-camp and a yacht marina. The total capacity of the resort is 1300 people. The resort is also equipped with a congress centre containing 12 halls which can take up to 2000 people. In the Solaris Camping beach mobile homes can be found as well as 800 camping plots. On an area of 2000 m2 a health and beauty Spa Centre can be found. What is particular about the resort is that the owners have built a replica of an old Dalmatian village in which you can experience the autochthonous spirit of the past times and try some of the autochthonous Dalmatian dishes. Also, a big old ship has been turned into a bar and there is a miniature golf course. Solaris Yacht Marina is protected from winds, it has 250 berths, electricity and water hook ups, Wi-Fi and much more. 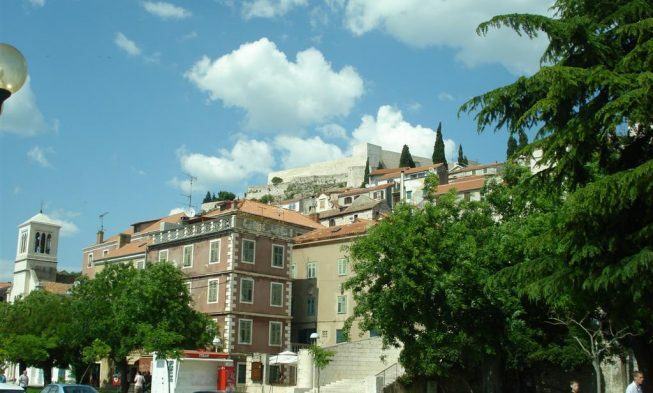 Several hostels can be found in Sibenik but some of the best hostels are Indigo Hostel and Mare Hostel. There are no camps in Sibenik itself but there are several in the surroundings. Autocamp Krka is located on the way to Skradin, 2.5 km from the National Park Krka. Half of the camp is hidden in the shade of pine trees; there are 40 camp units with a capacity of 120 people; wireless Internet is available in the camp. What Sibenik is most known for its cathedral of St James which is unique in Croatian as well as European architecture; it is completely built in stone from the island of Brac with no bonding material. It was built between the 15th and 16th century on the old main Sibenik square and what is also unique in are the 74 head sculptures by the famous Croatian sculptor Juraj Dalmatinac. Entrance to the church is charged 15 kn; in the summer months it is open form 8.30 till 20.00. In 2000 it was proclaimed a UNESCO world heritage site. 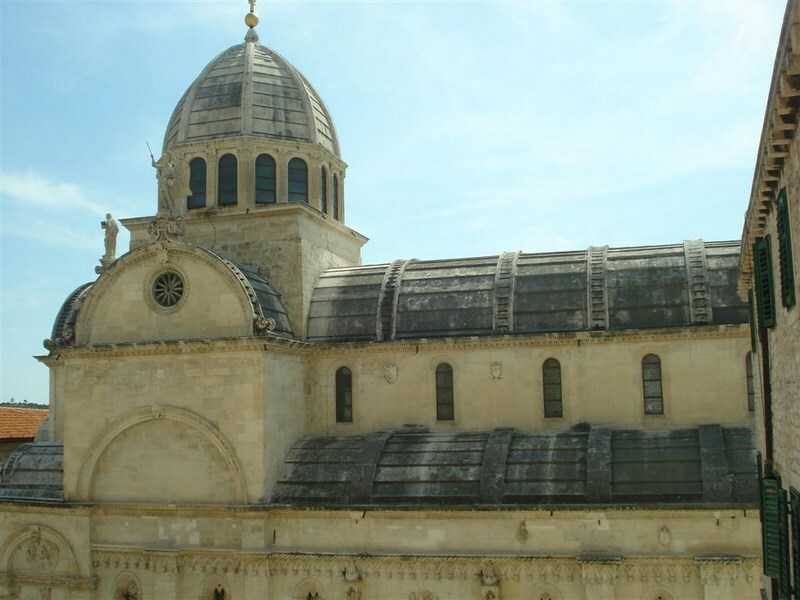 Sibenik is a town with a total of 24 churches some of which don’t function as churches any more but as museums and galleries. The square on which the cathedral is situated is the main town square which was for centuries a place of public and social life and in one period it was also a place of battles. On the main square there is also the City Hall built in the 16th century. In the old city core there is the Square of the Four Wells built in 1451 due to the lack of water during the Venetian rule. There is also the Bishop’s palace next to the cathedral on the seaside and the Duke’s palace on the shore. Several monasteries can also be found in Sibenik; one of them is the monastery of St Lawrence with its Medieval Mediterranean garden which is one of the rare gardens of this type in the world; the garden follows a medieval pattern with the form of a cross and a well in the middle. Sibenik is surrounded by four fortresses: St Michael, St John, St Nicholas and Subicevac which helped the citizens of Sibenik to defend from the Turks. Recently, the St Michael fortress has been renovated and turned into an open air stage, one of the kind in Dalmatia. Seven kilometres outside Sibenik, there is the Dubrava Falconry Centre; the centre provides bird watching of all kinds of birds of prey and takes care of injured, hungry birds and birds which are extinct. Fifty meters from the Sibenik cathedral, in an autochthonous Dalmatian house, there is the Aquarium of Sibenik where you can see the autochthonous Adriatic and tropical fish and plants. In the vicinity of Sibenik, 22 km in direction Krka National Park, you will find Dalmati Etno Land; this is a village in which you will learn about the old customs and traditions of the local people and their ancestors, see the old houses, tools and utensils used in the households and taste the traditional delicacies of the area. 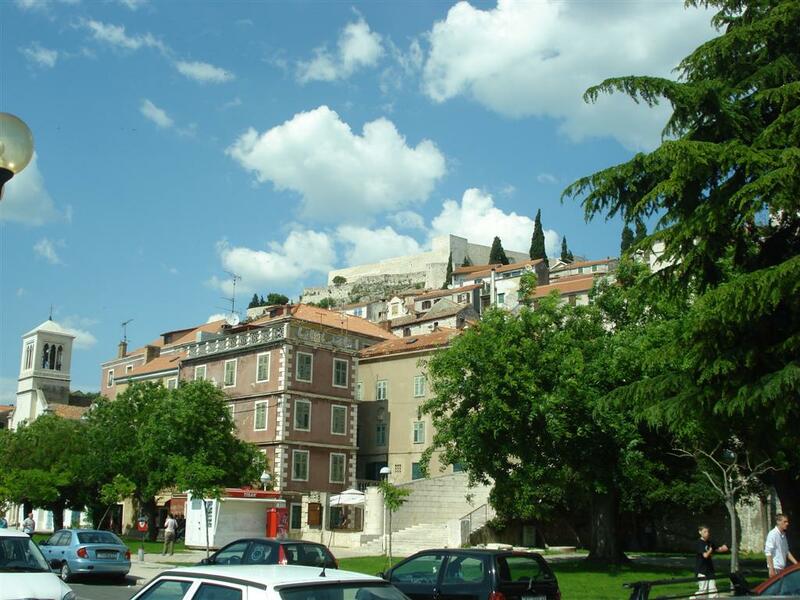 Sibenik has a great geographical position; it is located near several Croatian national parks. 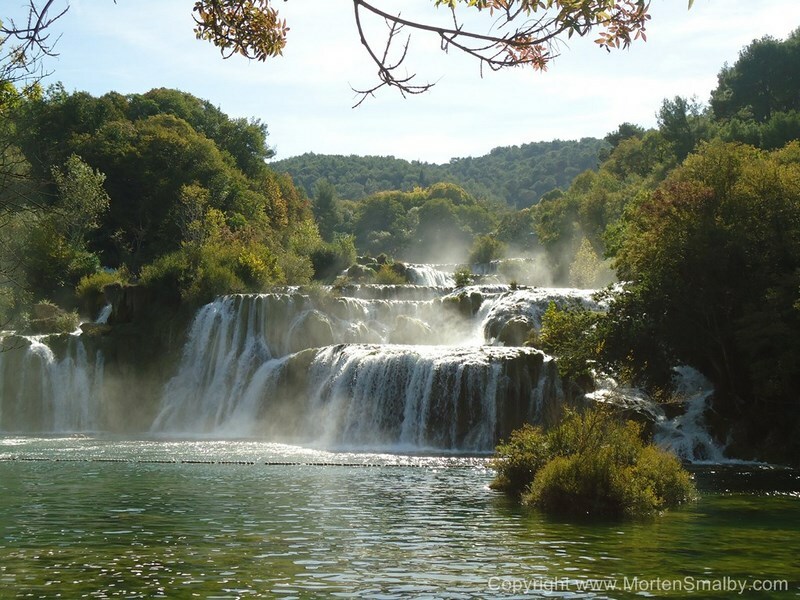 The closest one is the Krka National Park where swimming is also allowed; Kornati National Park – a group of islands far from civilization and noise; Paklenica National Park which is part of the Velebit mountain range. In the vicinity of Sibenik there is also the Vrana Lake Natural Landscape. It is possible to travel with some of the local agencies organizing trips or on your own. Sibenik, just like every other Dalmatian town has plenty of restaurants of different kinds. A restaurant to recommend is Pelegrini which is actually a konoba (traditional Dalmatian tavern) and a winery. This restaurant is situated next to the cathedral, within the old walls, which gives it a special atmosphere. Near the recently renovated Sibenik beach you can find the fish&sandwich street restaurant Sasula with affordable meals. The best solution, if you want to taste local delicacies at affordable prices, would be to find some of the konobas with organically produced food and domestic atmosphere. A bit outside Sibenik, the SuperNova shopping centre can be found. The centre has various shops; grocery store, clothes and shoes stores, drug store, bank, exchange office… There is also one more shopping centre situated at the eastern entrance to the city, Dalmare shopping centre; here you can also find all kinds of stores. For buying fresh groceries, there is a green market in the centre of Sibenik. D-Marin Mandalina Marina is located in Sibenik and it is one of the safest berthing places due to its natural protection. Next to it there is a shipyard facility providing refits, maintenance and all kinds of technical support for yachts. The marina has 429 berths in the sea and 50 berths on land, berths for yachts up to 140 lenght, exchange office, parking service, free Wi-Fi, laundry service, rent-a-car, sanitary facilities, water and electricity connection and more. Sibenik doesn’t have any big discotheques; you can have fun in some of the bars or clubs. Among the most popular are Dolac in the old city core and the Inside club. Those searching for some bigger places to spend a night out can go to Primosten and visit its famous Aurora club or Vodice and its Hacienda club. It can be said that Sibenik is a festival town. Every Thursday in July and August Dalmatian Chanson Evenings are held. Off Festival Blues&Jazz has been taking place in Sibenik since 2007 in the centre of Sibenik for three days in July. Terraneo festival is an open-air summer festival gathering world famous music names like Thievery Corporation, The Prodigy, My Bloody Valentine etc. 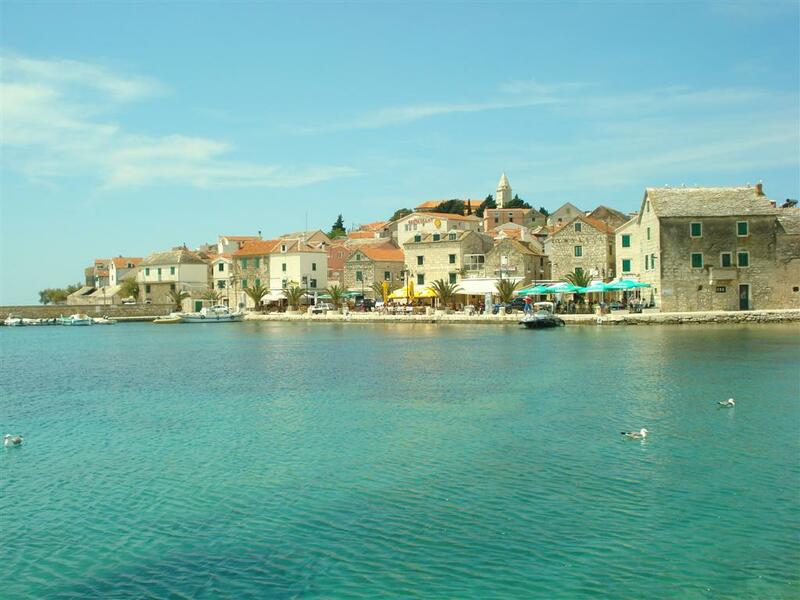 Sibenik is a coastal town so it is easily reachable either by bus, car or plane. It has very good bus connections with all parts of Croatia. If you are arriving by plane you can choose Split or Zadar airport and than take a bus to Sibenik. Arriving by car, it is possible to go via highway in which case you take the exit Sibenik; you can also go via the coastal road. Curiosity: Sibenik was the first Croatian town with street lights and the first in the world with a polyphase system of alternating current. Hi. Thank you for this wonderful information. 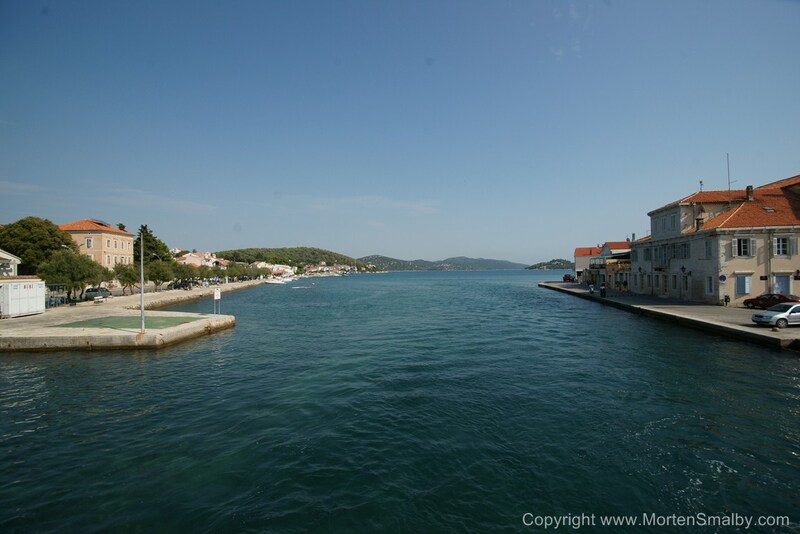 We will be going to the vodice/sibenik area in June. Would you happen to know which days the market with fruits and local foods is open in vodice and sibenik? Also what fruits are in season in June? Thank you!